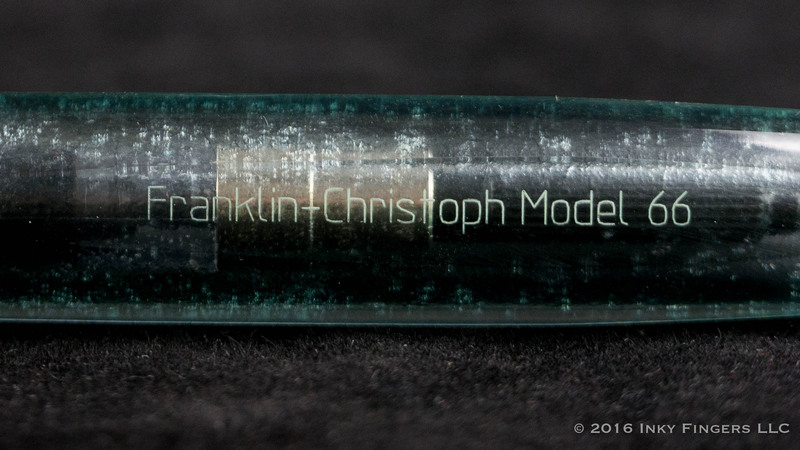 North Carolina-based manufacturer Franklin-Christoph occupies an interesting niche in the pen community. Unlike most manufacturers, they are a vertically-integrated operation, opting to sell their manufactured products directly instead of through regular retail channels. (Save for the odd special edition.) They handle the entire pipeline from manufacture to fulfillment and support. 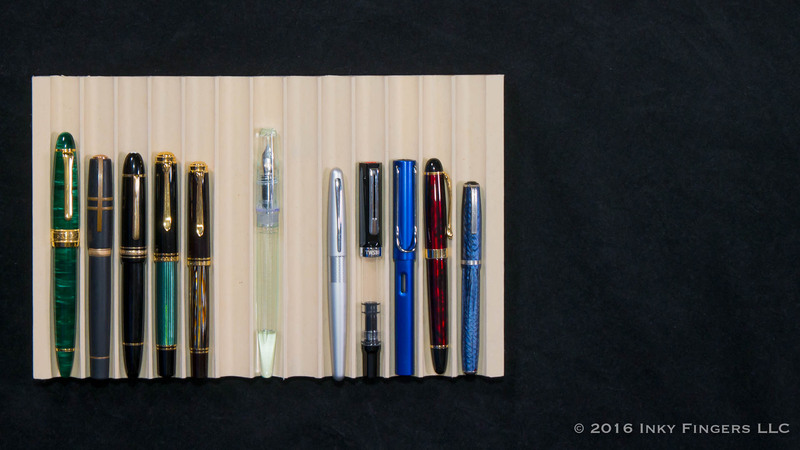 They have also become a darling of pen shows, inspiring fans of their unique designs and materials to hover around their table first thing in the morning, vulturing about, ready to descend on trays of one-off color prototypes. They are not your father’s pen company, and it seems to be working out pretty well for them. 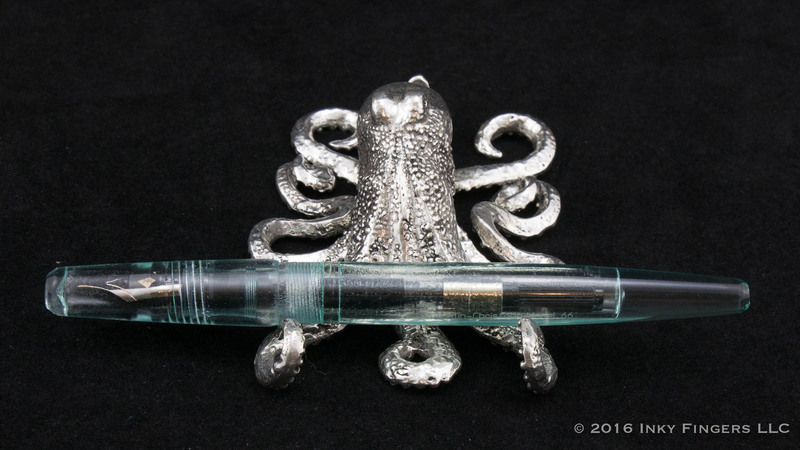 In addition to their cult-like following, they have further differentiated themselves by going after very unique, and in some case, really unusual designs coupled with materials and treatments you don’t often see in other manufacturer’s pens. 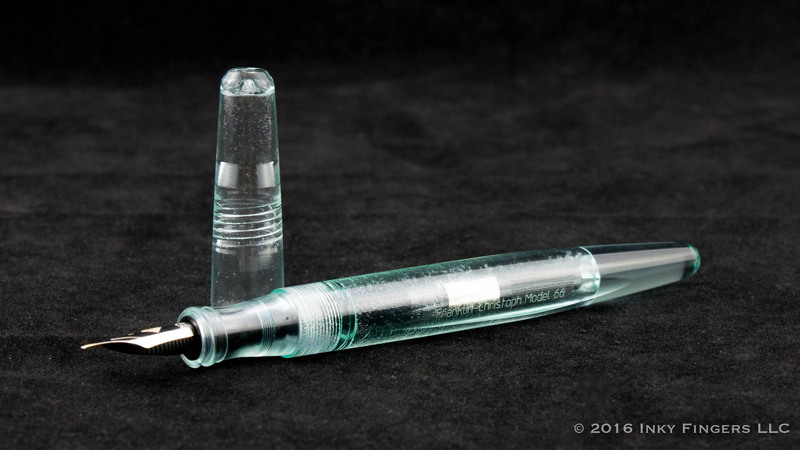 Perhaps the Franklin-Christoph model that most exemplifies this unusual combination of design and materials is the Model 66 Stabilis in Antique Glass acrylic. The Model 66 Stabilis, which won the 2015 Pen World design award for Distintive Daily Writer, is a long, clipless desk pen with a streamlined shape. It was based on the pen show tester pens that Franklin-Christoph uses to test inks and different nib grinds. Much longer than the traditional daily carry type of pen, the 66 looks like a cigar-shaped pen that has been stretched out and had the ends chopped off. The entire exterior of the pen is smooth and circular, except for a flat spot which has been cut into one side of the pen. 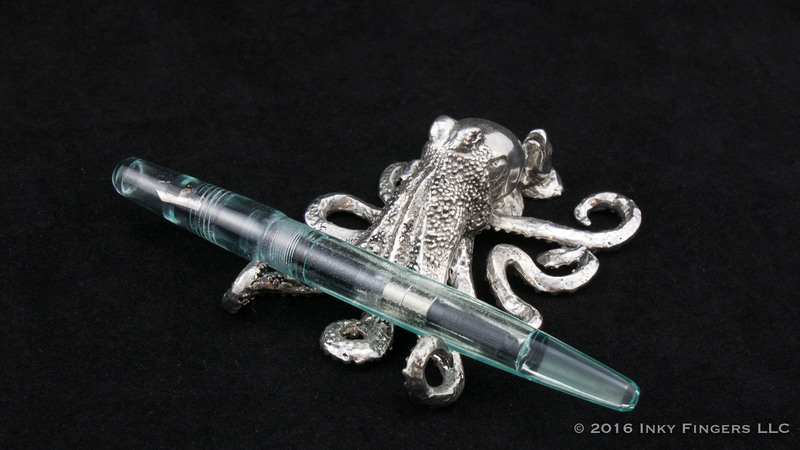 This platform serves the dual purpose of keeping the pen from rolling off the desk and onto the floor in an undignified manner, and giving Franklin-Christoph a good location on which to engrave the pen’s branding and model number. 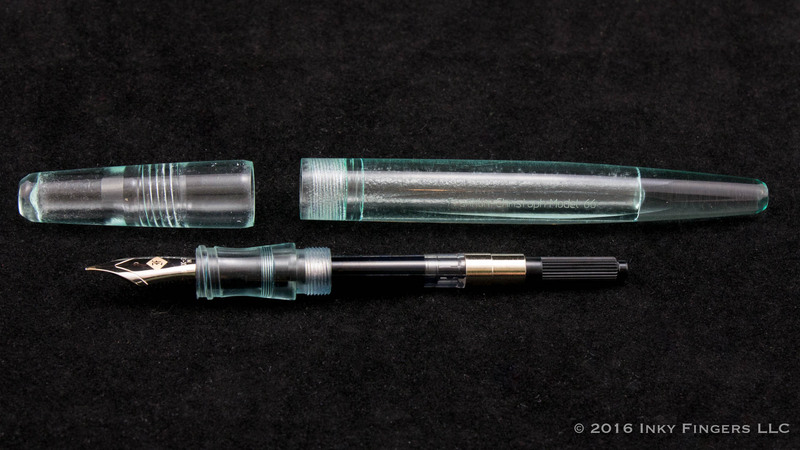 The entire pen is made from a slightly tinted, clear acrylic that Franklin-Christoph calls “Antique Glass.” In the pen community, though, the material is colloquially referred to as “Coke Bottle.” It’s not hard to see where the name comes from. 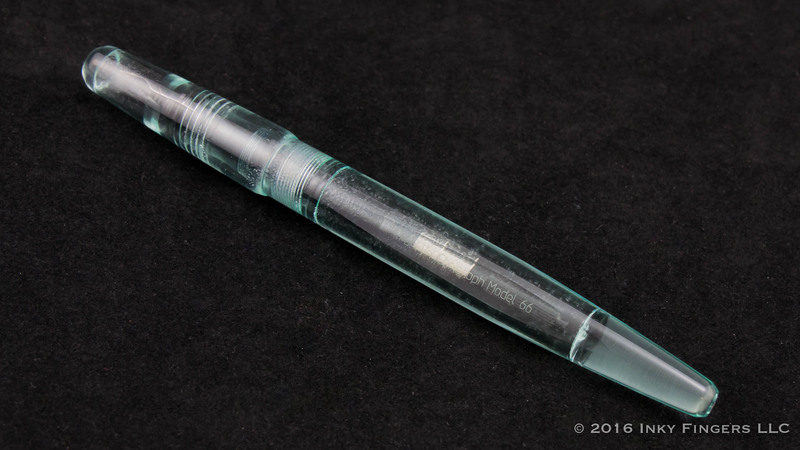 The slight blue-green hues, the absolute crystal-clear polish, and the mottled treatment of the interior surfaces does result in a pen that looks like it’s made from an old glass soda bottle. The exterior of the pen is a smooth, perfectly glossy finish that feels wonderful in the hands. The interior surfaces of the pen (the inside of the cap and the barrel) have been treated in a process which etches away some of the materials, leaving an almost pebbled consistency. 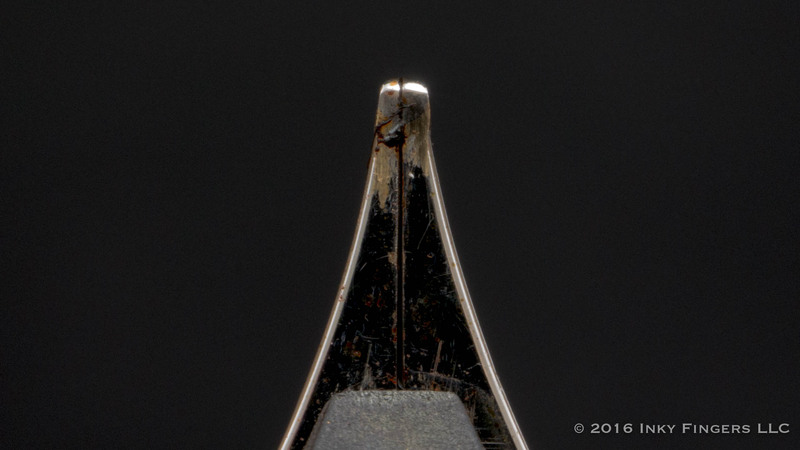 It provides a nice contrast to the pen’s pointed rear end, which is crystal clear. 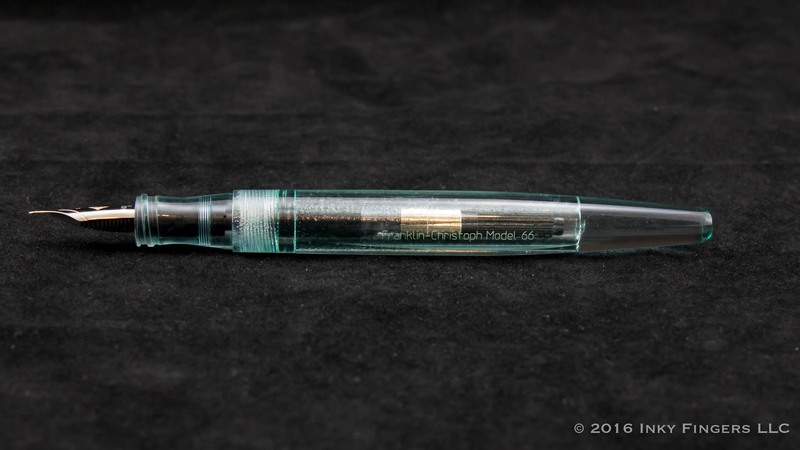 The Model 66 has a short cap: It’s just long enough to cover the nib and section with not much room to spare. 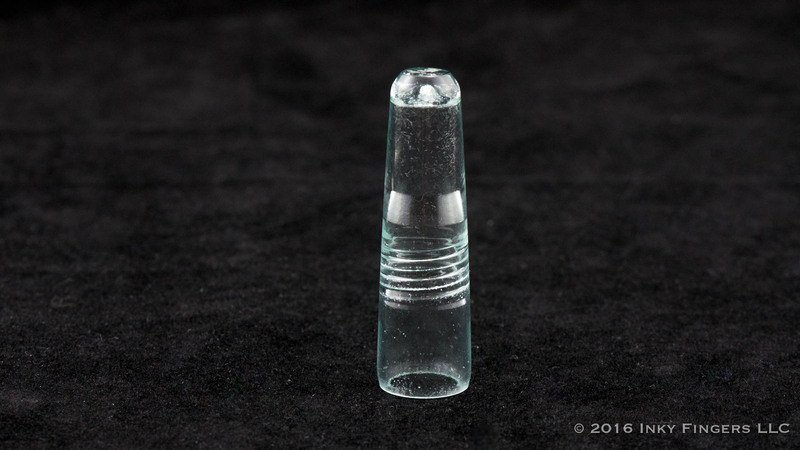 The clear acrylic of the cap is marked by the large block thread found on many Franklin-Christoph pens. Like on the Model 02 I reviewed quite a while back, the threads are on the very edge of the section nearest the nib, so they won’t get in your way if you tend to grip the pen further up the section like I do. 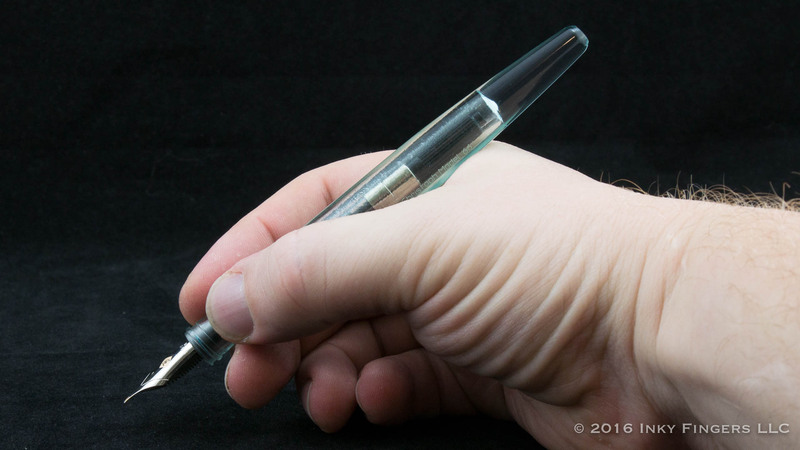 The cap can be posted, but it’s so short that it doesn’t add a great deal to the length of this already-long pen. 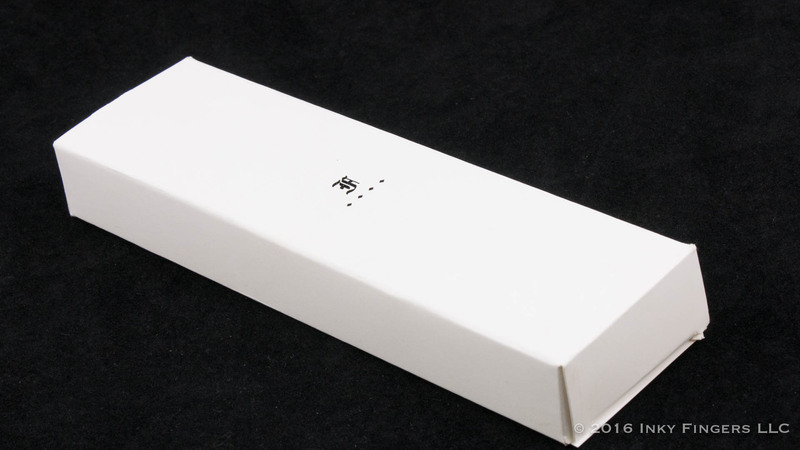 The unusual shape of the Model 66 means that this pen may not fit comfortably in a lot of pen cases due to its long length. It’s not a terribly thick pen, finding a nice middle-ground to feel in proportion to the long length without feeling overly slender. It’s quite comfortable in the hand, lightweight and nicely balanced for me when unposted, which is how I prefer to use the pen. I can post the pen, but have rarely felt the need to do so. And that leads me to one of the issues with this very popular Antique Glass finish. The treatment which gives this unique material its attractive look also has the potential of causing micro-fissures in the inner walls of the cap and barrel. If you use cartridges or converters, chances are that you’ll never notice if they are there. 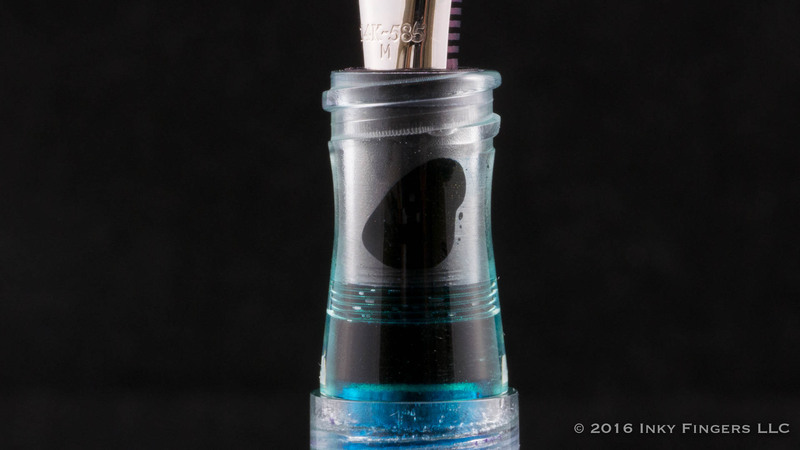 If you like to eyedropper your pens, though, it is possible that ink can get stuck in those micro-cracks and be difficult to remove. I had this happen with my pen: when I experienced my inksplosion at 30,000 feet, some of the purple ink in the pen got stuck in some micro-cracks around the edge of the cap, and wouldn’t come out despite several repeated cleanings with a variety of solutions and methods. Fortunately, Franklin-Christoph is known for its superb customer service, and when I reached out to them asking about the possibility of getting another cap, they provided one free of charge. I spoke with Scott Franklin about their policy, and they said that this issue happens rarely, but when it does, they will replace parts free of charge. It hasn’t happened to me since. 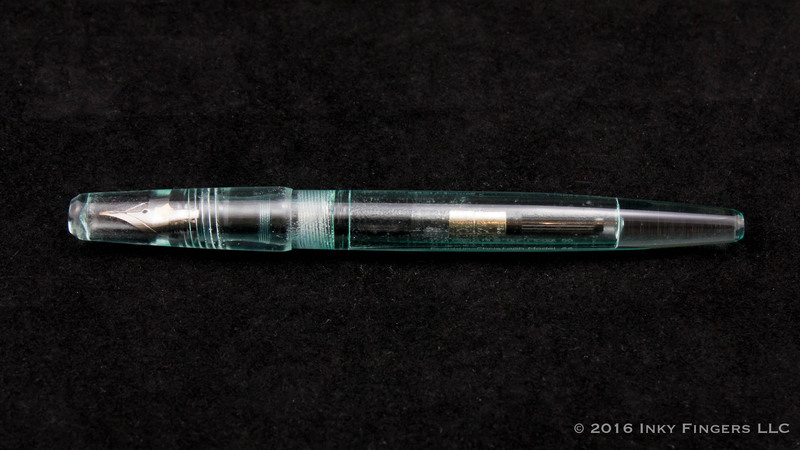 The pen houses a #6-sized Jowo nib unit. I bought my 66 at the LA Pen Show in February of 2016, and at the time, had it fitted with a 14k Gold Medium Cursive Italic nib. 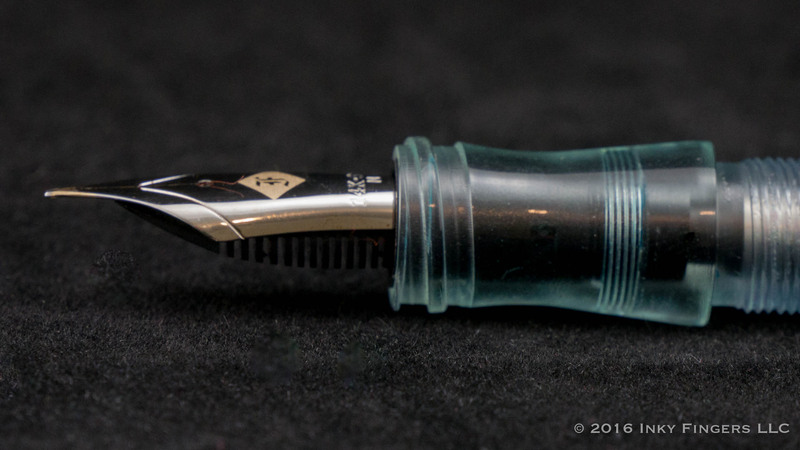 The nib is slightly bouncy, very nicely ground, and writes well. I will say that it tends to be just a little persnickety about the ink that I use, not liking inks that tend to run a touch on the dry side. But aside from that, I’ve had no issues with it at all. 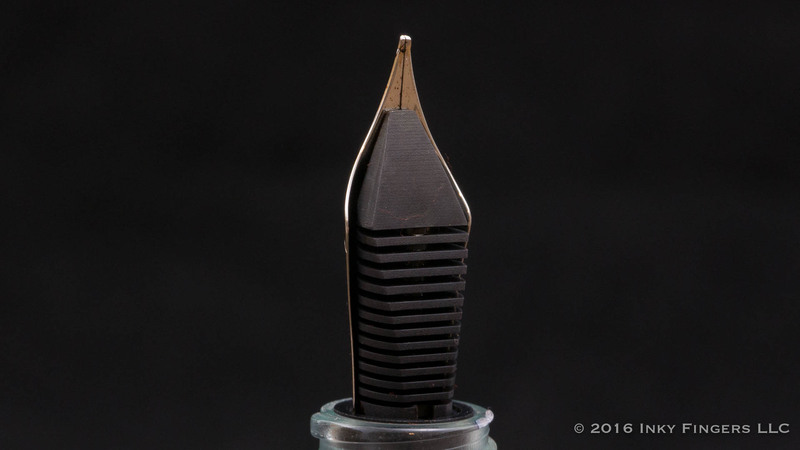 And, of course, the entire nib unit can be unscrewed from the section and replaced with another, giving you an opportunity to swap out nibs to your heart’s content. Franklin-Christoph offers one of the largest selection of nib grinds of any manufacturer. All of their nibs are Jowo nibs, but the available grind list is impressive. They have the standard sizes in both steel and gold, and have enlisted the service of one of the world’s premier nibmeisters, the inestimable Mike Masuyama. Mr. Masuyama provides needlepoint grinds, stubs, and italics in a variety of sizes, in both steel and 14k gold. 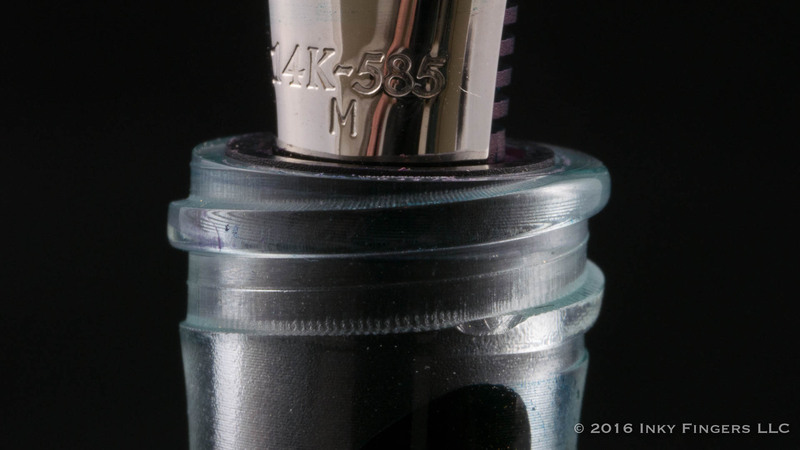 In addition, Franklin-Christoph has developed a grind they call a “SIG” grind, short for stub-italic gradient. Basically, the pen will write like a stub nib or an italic nib, depending on the angle to which the pen is held to the paper. 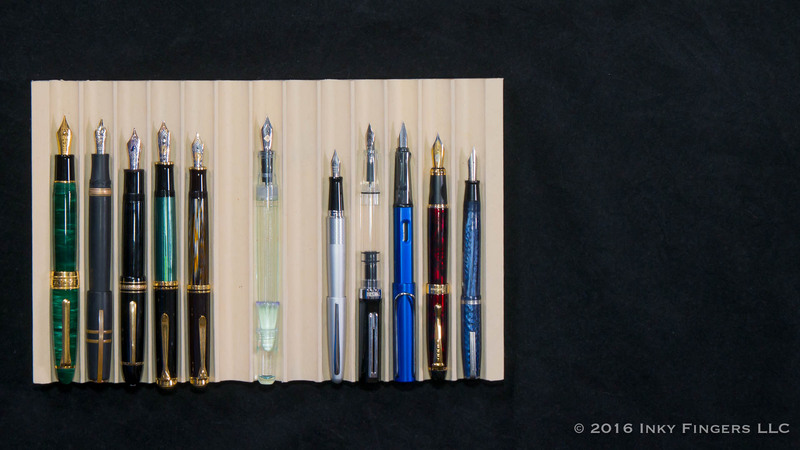 I had a chance to use one of these SIG nibs recently at a Seattle-ish Pen Posse meetup, and was floored by it. 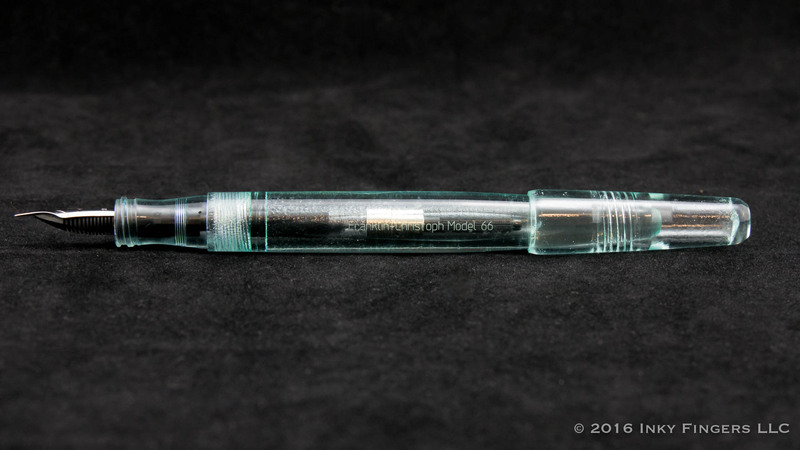 I suspect I will get one of those on my next Franklin-Christoph pen, I liked it so much. In the hand, I found the 66 to be quite comfortable. I used it with several different inks and never experienced much in the way of ink starvation. There were never hard starts or skipping. I would write for long sessions without cramping or finding myself gripping too hard. It is a beautifully balanced pen, which, especially when eyedroppered, is meant to be used for longer writing sessions. After having owned this pen for nearly a year, I still really like it. Generally speaking, I’m not super-excited by demonstrators, but this one has enough interest in the material to stand out a bit from the crowd. I also almost never convert my pens to eyedroppers. This pen looks amazing when the barrel is filled with ink…especially some ink with some pizzazz, like J. Herbin Emerald of Chivor. But if you use a converter, it’s a lot less interesting to behold. 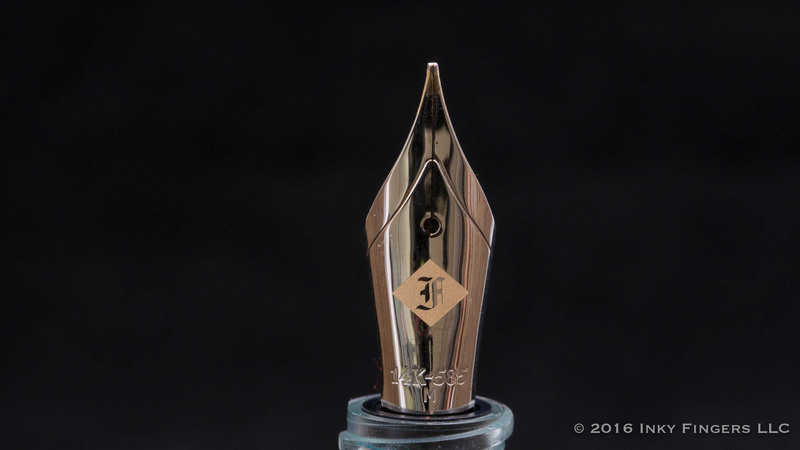 The Franklin-Christoph Model 66 Stabilis starts at $169.50, and goes up in price depending on whether you select a gold nib and/or a specialty grind. This price puts the pen in comparison with similar pens from Edison, and those from larger manufacturers like the Lamy 2000, Pilot Custom 74, and Platinum 3776. 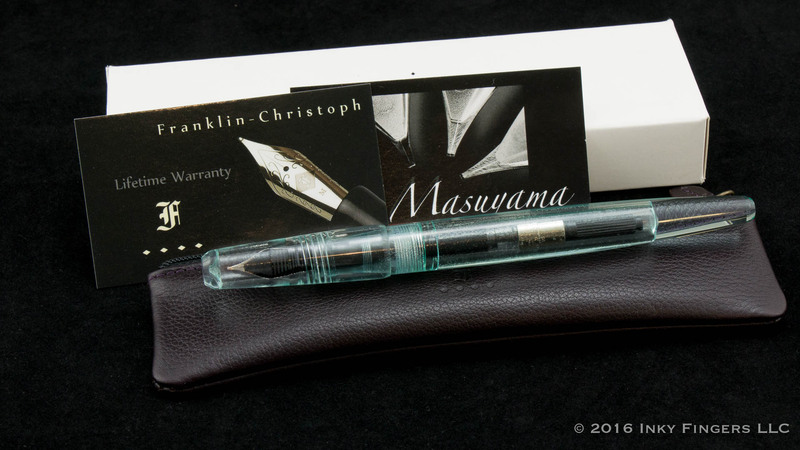 From a construction standpoint, the Franklin-Christoph is as well made as any of those, and should write beautifully out of the box. It’s a pen that will work and work and work all day long for you. 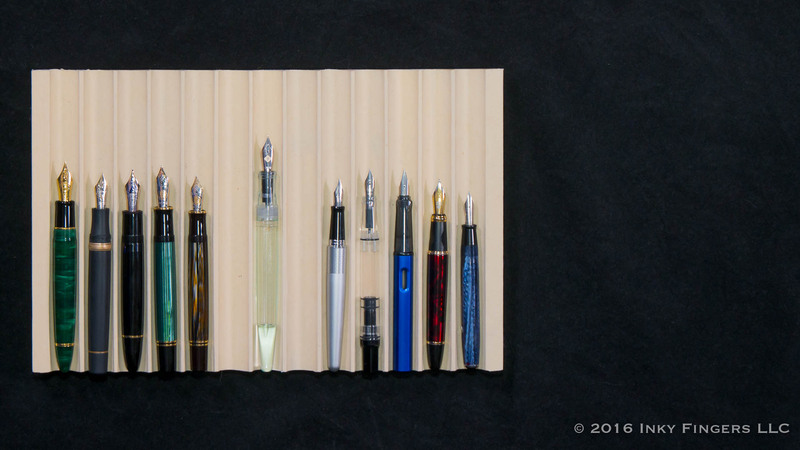 It is, however, very different than most other pens on the market, and its size, materials, and overall aesthetic will strike some people’s fancy more than others. I really like the pen, and I find myself using it often. I don’t know that I could say I love the pen’s visuals, but I do love the writing experience.